UPDATE: McDonald's has responded to fans and is promising more Szechuan Sauce. See below. Somehow, Adult Swim's Rick and Morty managed to create a fervor for McDonald's long-discontinued Szechuan Sauce that has exceeded all expectations. The cry for its return was so loud McDonald's decided to re-release the sauce in a limited quantity for one day only. That day was October 7. The passion to put that brown sauce on taste buds was so strong the "limited quantity" ran out almost instantly in many locations. The dearth of Szechuan Sauce left the sauce-starved masses ready to riot. They really wanted to dip some chicken tenders. Fans have reported being told some stores only got 20 packets. Others report their local store was sold out of Szechuan Sauce before the announced start time. (Sounds like Rick swooped in and scooped them up before things could *burp* get underway, Morty.) At the time of publication, McDonald's had not responded to a request for comment. Others on social media said their local stores carried more than 20 packets, so it's unclear whether the 20 packets reports are factual or a game of sub-space telephone gone squanchy. Rick and Morty fans who lined up to taste what got Rick so worked up let their frustration out on social media. I don't think you understand how sociopathic and evil "the best fans in the multiverse" can be. Rick said it best: "Never betray me." 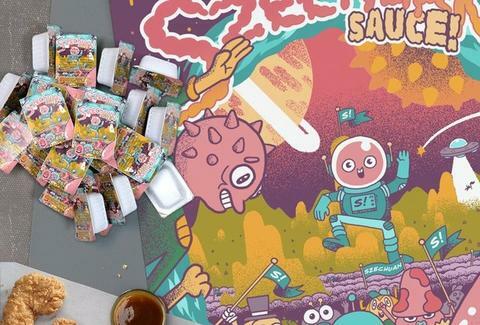 McDonalds sends every store 20 packets of "Rick and Morty" sauce. Fans waited all night in line find out, immediately Ebay their packets. Further frustrating fans, many packets have found their way onto eBay for ridiculous amounts of money. Each auction has many people watching it, but basically no one willing to pay hundreds of dollars for a little Szechuan Sauce. Of course, there were a few Mortys in the crowd who could see the forest for the trees and didn't assume the employees of their neighborhood McDonald's were a part of some intergalactic Council of Ricks. I feel like all those #RickandMorty fans who are rioting about not getting McDonald's szechuan sauce should rewatch the ep for perspective. Hundreds of people waited for hours in failed attempts to have try a condiment they only like because they were told to by a cartoon man. You probably don't want to get to the point where you want Szechuan Sauce as badly as Rick does. don't let it be your one-armed man. Things get dark on that path. Following the outcry from fans, McDonald's released a statement Sunday night promising more of that sweet Szechuan Sauce. You can read the full statement below, but here's the part fans will be most excited about. "So we're gonna make this right. In the last 24 hours, we've worked to open any portal necessary. And it worked. Szechuan Sauce is coming back once again this winter. And instead of being one-day-only and limited to select restaurants, we're bringing more—a lot more—so that any fan who's willing to do whatever it takes for Szechuan Sauce will only have to ask for it at a nearby McDonald's." The statement doesn't offer details about the future release, closing by telling all the Ricks out there to "stay tuned."